Did you know that brown adipose tissue, or brown fat (also known as thermogenesis fat) is a good, fat-burning fat in your body? Believe it or not, this is a type of fat that burns your excess body fat. Amazing, isn’t it? Read on to find out how to leverage the fat burning brown fat in your body and burn more calories rather than store them as unsightly flab. Shocking as it may seem to you, not all your body fat is bad. Your adipose tissue is NOT an inert mass. On the contrary – it’s an active and important endocrine tissue, vital for your survival… This is especially true for the brown body fat. A good body fat percentage is the healthy amount of fat that you absolutely must have in your body. This essential body fat is not only an insulator that preserves your body’s heat and energy, but also the critical support for all the chemistry between your brain and the rest of your body. Your body’s essential fat produces many necessary enzymes and hormones, controls your body’s immunity, inflammation levels and more. 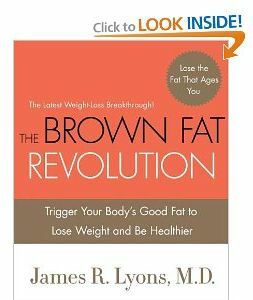 In fact, in his book Brown Fat Revolution: Trigger Your Body’s Good Fat to Lose Weight and Be Healthier, plastic surgeon Dr. James Lyons explains in great detail that, contrary to popular belief, triggering a totally different and deeper type of body fat (i.e. the brown fat) is the secret to a lean, healthy body. Dr. Lyons’s conclusions are confirmed by several recent studies done on this type of brown adipose tissue and published in many scientific journals like Medical News Today (2012), New England Journal of Medicine (2009) and others. As you can see, this is very new info. Both of these types of body fat are “good” and necessary for several basic bodily functions – as long as they are not in excess. But when you start to gain weight, the excess fat is stored as a yellow, mushy mass of fat both subcutaneously and internally (as visceral fat). And it is this excess visceral fat that’s especially risky, exposing you to the many health dangers of being overweight. But let’s go back now to the fat-burning brown fat. That’s because its cells are loaded with mitochondria (specialized, energy-producing cells) that contain iron–that’s why the reddish-brown color. Until recently, scientists thought that only newborns have brown body fat, which helps them stay warm, and that brown body fat disappears with age. But recent scientific studies show not only that this brown adipose tissue does not completely disappear with age, but that thin people have more of it than overweight people. How does this fat-burning type of fat help you get rid of your subcutaneous fat that’s on your buttocks, hips, and thighs? Well, you have to remember that brown fat is heavily involved in regulating your body temperature, consuming a lot of energy – in the form of calories. So a bigger amount of brown body fat, which develops in lower temperatures, actually helps in burning more calories. Could it be as simple as turning down the heat to burn more calories? Actually, there’s more to it. You already know that the yellow fat is your storage fat, your source of energy during lean times. While a little is essentially useful, in large amounts it affects not only your body image and self-esteem, but all your other bodily functions as well. In contrast, this brown adipose tissue known as brown fat, or thermogenesis fat, is your fat-burning fat. To understand how fat can burn fat, we need a bit of background… Here’s what thermogenesis is all about. Directly related to your metabolic rate, thermogenesis is the biochemical process that raises your body temperature through mitochondria (specialized, energy-producing cells in your brown body fat). They work around the clock converting your body fat into heat energy to maintain your body’s constant temperature or raise it when needed. When you have a healthy metabolism, mitochondria in your thermogenesis fat also convert any extra calories that you eat into additional heat energy, making you sweat. As you can see, thermogenesis explains why it may be that a friend of yours can eat all day without gaining an ounce, while you may put pounds on just thinking about food! Your friend has a more active brown body fat, while your brown fat might be dormant. Agonizing, isn’t it? But why is that? Well, part of it is a low thermogenesis in your body (a low level of sweating), but another part is the quality of your daily diet. That’s because brown body fat becomes less active and ultimately shuts down completely when – as a result of eating highly processed foods on a regular basis – you start to experience an essential fatty acid deficiency. Believe it or not, the activity of your brown fat can be adjusted to help you burn off extra calories instead of store them as sluggish, yellow body fat and avoid the many health risks associated with being overweight. Before we wrap up… let me ask you this. Do you want to burn the excess body fat and get fit in the shortest amount of time? Do you need practical solutions along with a structured, short- and long-term strategy to maximize your body’s fat-burning engine?